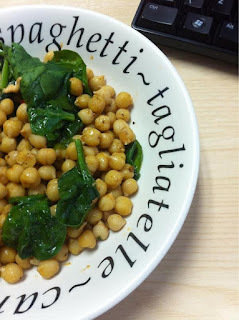 A little lunch idea for you which is ridiculously easy, healthy and cheap to make! It is in a similar vein to my recipe for Spiced Chickpeas and Peppers but I’ve altered it so all you need to do is chuck in some flavourings with some freshly boiled chickpeas. I used dried chickpeas which I soaked and boiled with stock for 40 minutes before draining and adding the dressing. But because these are meant to be easy I’d recommend using tinned. All you need to do for tinned chickpeas is boil them for about 5 minutes. 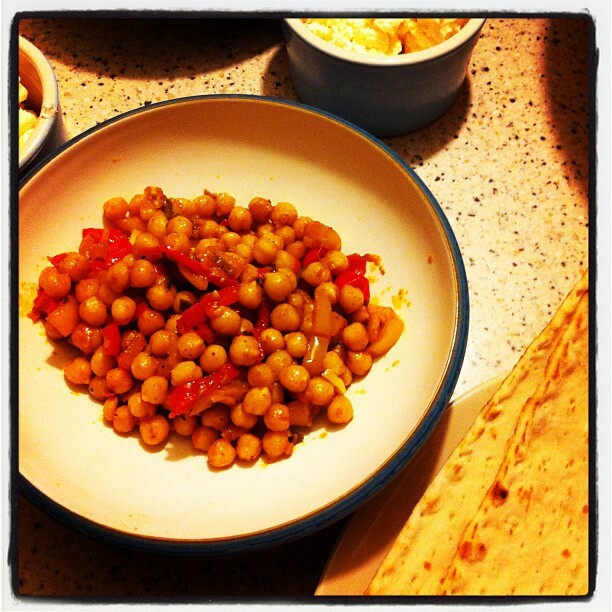 Having the chickpeas warm when you add the dressing really helps them to soak it up a bit more. half a chilli, finely chopped. Add all this to your bowl/pan of freshly cooked chickpeas, stir, cool, store in the fridge and then put into your tub for lunch. I put some fresh spinach on top of mine, the whole thing gets a quick 1 minute zap in the microwave to wilt the spinach and lunch is done! I have mine with a dollop of houmous. This is a dish based on a lovely chickpea salad I had for lunch, and inspired by it and the desire to make it better it became a very nice weeknight dinner. I used dry chickpeas, soaked overnight and whilst I was at work, soft fried peppers, lots of homegrown chilli, garlic and spices. I siimmered for a while and then topped with feta cheese and piled onto warm flatbreads. I used dry chickpeas here because they do taste nicer, I find they are less floury, but you can substitute canned. I didn’t make the flatbreads, but instead use the new Warburtons square wraps, they are based on the idea of tortilla wraps but are thicker and less like chewing on plastic than the normal ‘mexican’ style ones you find in supermarkets. I’m going to use these for square tacos soon! Or 1 can of chickpeas. 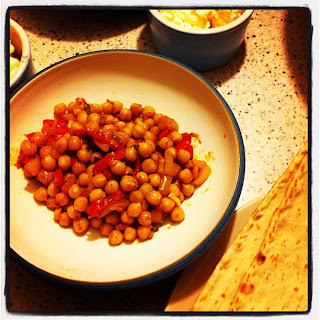 Boil your chickpeas whilst you do the peppers, if you are using dried chickpeas. Cut your peppers into thin strips and fry on a high heat for a few minutes with some seasoning. Add in a little honey and the red wine vinegar and then pop the lid on and reduce the heat. This will soften the peppers. Simmer gently for 10-15minutes. Fry the garlic and chilli in olive oil for a minute or so, then drain your chickpeas (either after boiling or from your can) and throw them in. Add in the spices, tomato ketchup (yes it seems a bit strange but it gives the dish a sauce and tomato-ey flavour) and season. Stir in your softened peppers. Simmer for 5 minutes to let everything flavour the chickpeas and peppers, add a splash of water in it if looks a bit dry. Pile into bowls and serve with some oven warmed flatbreads and feta cheese on top. A sprinkle of chopped coriander wouldn’t hurt either. Never before have I made so many recipes from a recipe book before. I think I am like a lot of people, I buy cookbooks promising to try all the recipes, I look at the pretty pictures, feel my stomach grumble, make one or two and then resign it to the shelf. Google is a lot quicker if I need to find a recipe in a hurry so my books get neglected. I’ve loved the recipes from this book, and we’ve been watching the TV programmes too. Mr. Giraffe became a vegetarian nearly a year ago so I’m really glad to find a book full of many recipes that are inventive and veggie. Our favourite by far is the broad bean and pea bruschetta – we use frozen peas when there are no broad beans in season – topped with crumbly goats cheese or feta. A small portion makes for a lovely side to a plate of pasta too. We’ve also made the polenta chips, the mushroom stoup (make lots of this, it tastes better the next day), beetroot soup, aubergine parmigiana (Sainsburys basics ‘italian hard cheese’ is veggie and also tastes pretty good) and the beetroot tarte tatin. Next on the list is the rest of the book – but more specifically the cauliflower pakoras, chickpea ketchup curry (for a day when we are feeling lazy!) and the beetroot and chocolate ice cream. I cannot recommend this book enough, whether you are veggie or not, it is huge so you’ll find something you’ll like. And I agree with Hugh that we all need to eat less meat, not no meat but a lot less than we eat now. I’ve also forgiven Hugh for cutting his hair, this book has made up for him having run of the mill short hair. Whilst it might seem a cliche, since Mr. Giraffe became vegetarian we’ve been eating a lot more aubergine, a lot of people describe it as being meaty – although I don’t really see that – but it is very substantial which means it is easy to make it the centre of a meal. This is my ‘sort of’ sea spiced aubergine, it is probably not very authentic but it has all the right mix of flavours – deep savoury, chilli burn and a little sweetness. This always takes me longer to make than I think, due to the fact that aubergines take SO LONG to roast. After they are roasted the dish comes together pretty quickly though. Heat the oven to 180 degrees c / gas mark 4. Line a baking dish with foil and wrap your aubergines and chillies up in the foil, drizzle with sunflower or a mild olive oil before you seal. Roast in the oven for about an hour to an hour and a half, about half way through remove the chilis and turn the aubergines. Slice the chillies in to small pieces. If you don’t want too much heat you can use 1 chilli, or leave the seeds out. For the sauce mix all the ingredients together in a bowl with the roasted chillies. When the aubergines are ready, remove from the dish and let them cool so they aren’t going to burn your hands off when you slice them. They should be very very soft and collapsed slightly. Cut your aubergine into rough chunks, about 2 inches. Heat up a large frying pan or a wok, add in some sunflower oil and then your aubergines. Fry for a minute and then pour in your sauce, followed by a little hot water if it is a bit dry. Simmer for 5-10 minutes on a medium to low heat. Serve with egg fried rice or fine egg noodles.